Brrrrrrrrrrrrrr! It's been hitting the single digits here for the past week, and everywhere I look, there's ice. All of this glittery, sparkling wonderment outdoors is helping me notice things indoors that are catching the light in lovely ways, too. Perhaps with some people, they'd just see a piece of toast and a pair of glasses, but really, it all depends on how you look at it, don't you think? I put a vote on Facebook for my photographer friends: Should we be called "photoptomists" or "optimographers"--we of the breed who are making the best out of winter with our cameras? The vote was nearly unanimous: Photoptomists we are! Sure, I wouldn't mind if it were a good forty degrees warmer. But right now, I'm seeing the world through very sparkly, frost-covered glasses. How 'bout you? Are you making the best out of winter, or are you just barely muddling through? I'd love to hear! I hope your holiday season has been warm and wonderful so far! (Mine has involved too many cookies!) We have a caravan of relatives on the way to stay with us through the new year. Eleven of us under one roof--luckily, we all genuinely like each other! I want to give them the love and attention they deserve during their stay, so this is the last time I'll be writing to you in 2014. I just participated in Susannah Conway's "Find Your Word." (So much fun!) She led us through five days of creatively pinpointing the one thing we most want to focus our efforts on during the year ahead. On Day 4, it finally sunk in that I needed TWO words. One that focuses inward -- contemplate -- and one that focuses outward -- radiate. And because I'm visually driven, I needed to translate my words into pictures. For contemplate, I chose a picture of the woods behind our house because I contemplate best when I'm simply looking out at the woods, letting my thoughts wander wherever they may. I keep a sketchbook in hand to jot down whatever comes to me--pictures, words, dreams, and a fair share of nonsense. It's important for me to take time to be mindful each day, instead of rushing from one thing to the next. For radiate, I chose a picture of ice on branches, ice being melted by the morning sun. I like the idea of light and warmth, and embodying both, sending the positive energy outwards. So, here's my end-of-the-year wish for you: I hope that you find your word for the year ahead, something to ground you and guide you, a little bit of magic that will lift you up and let your soul sing its sweetest note. Happy, happy, happy 2015! JOIN ME in January! My photography e-course, "How to Take Better Photos of Nature and the World Around You" begins on January 5, 2015: Click here for details and registration. 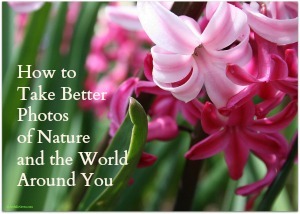 Tags: how to take better photos of nature, nature photography course, online photography course, photography e-course, Susannah Conway "Find Your Word"
One of the tricky things about having a blog is that it takes a bit of time for it to find its "friends"--the faithful readers who share your interests and your general views of the world. I've been receiving Joyfully Green since Christmas 2012. I want to personally thank you for the beautiful, quiet photos. I am 76, still cook daily and enjoy baking new recipes. I too have been taking photos since a teenager with my Brownie. Still love the art of photography! For this weekend's round-up of Joyful Reads, I wanted to share some of my very early posts about winter and the holidays that most of you probably missed the first time around, when it was just me, my relatives, and the crickets. I hope you enjoy them! Wishing you a wonderful winter weekend (or a special spring weekend, if you're on the other side of the world!). Last month, I presented a special exhibition of pictures created by the students in my "Art of Photography" e-course and it turned out to be one of my very favorite posts ever. Not just because I'm crazy-proud of my students (which I am! ), and not just because their photographs turned out beautifully (which they did! ), but because I remember where each of those students began. Every one of them had taken my first e-course, "How to Take Better Photos of Nature and the World Around You." Some had a little more experience behind the lens than others (in fact, a couple were true beginners), but all of them had a common thread: A keen interest in photography mixed with a wonderful willingness to learn how to improve their skills. I want to show you the kind of gorgeous work YOU can create with this course, which is now enrolling for January 2015. The Early Bird discount (to save $15) expires tonight (December 10, 2014 at 11:59 p.m. EST). You can still enroll up until the day before the course begins, but after tonight, it would be at the regular pricing. 1) You can have a full-time job and still take this course. That's one of the best things about taking an online course instead of a "classroom course." The daily lessons are emailed to you in the morning, and you post your photographs into our private online classroom whenever you can--even at 2:00 a.m.! Or, catch up on the weekend. 2) You can live anywhere in the world with computer access and take this course. The previous two sessions of this course have included students from the United States, Canada, Australia, and Europe. As long as you can understand English, you'll be fine. 3) You don't need a fancy camera to take this course. Many of the students use their smartphones. 5) Your growth as a photographer doesn't stop when the course is over. I'll continue to give you advice and guidance on your work in our online classroom, which will stay open so you can stay connected with me and with your classmates. Ready to see what beautiful images you can create? Sign up today to join me in January! P.S. If you're giving this course as a holiday gift, please let me know the name and email address of the student in the "comments" box of the Paypal checkout. P.P.S. Very special thanks to my students for letting me share their work with you here! © 2014 by Joy Sussman/JoyfullyGreen.com. All rights reserved. All photos and text digitally fingerprinted and watermarked. Please do not use any of these photographs (which are the creative property of my students as noted, except for the top photograph, which is my creative property) without asking me first for permission at JoyfullyGreen.com@gmail.com and then clearly linking back to this site with photo credits. Site licensed by Creative Commons. There's something that is pure magic about the first snowfall of the year. It takes us by surprise as the first flakes start fluttering down. And then it takes us by surprise again, when it decides "to stick." All children seem to love snow, anytime, anywhere. For adults...not so much! They grow weary of it, and fast. Last Thursday night, when it started to snow for the first time this season, both of my children headed out with cheering excitement to the back yard, in their pajamas and winter coats. Each child held up one arm high, like two Statues of Liberty, both holding a cup instead of a torch, to catch the fat flakes falling. On Friday morning while I was taking Delilah on her walk, I saw a neighbor standing out in her driveway in her pajamas and robe, holding a coffee cup. She waved to me and called, "I just had to come outside--it looks so beautiful!" Our little corner of the world was glittering in the rising sun, and I agreed with her completely. Brrrrrrrrrrrr! November is blowing into town with a furious and chilly wind today! The dried-up leaves are swirling through the air in a frenzy, whirling like dervishes. (Did you ever see a whirling dervish? I included a link with a video, below--interesting!) It's time to put on the winter coat, without feeling like I'm foolishly overdressed for the weather. It's time to cozy up in sunlit corner chairs with thick quilts and thick books. It's time to welcome November again. When I moved to Philadelphia with my soon-to-be-husband, it was a shock to us that the streets of our new city emptied out between 9 and 10 p.m. The only people still out walking around after that hour were hoodlums and homeless people. Everybody else seemed to be tucked in and tuckered out. Having a blog, I sometimes find myself typing away towards midnight, but the truth of the matter is that I'd rather be fast asleep at midnight at this point in my life, and more often than not, I'm nodding off at 10 p.m., the time I'd just be starting to head out the door during my New York era. I think the technical term for this is "aging." I have all kinds of new neighbors to greet (and photograph) in the early morning hours. It's not just the early birds who are out for the breakfast buffet--I often see deer, foxes, rabbits--and they're long-gone by lunchtime. That's the thing about morning: You have to catch it before it's gone. How 'bout you? Are you a night owl or an early bird? Why? Let's hear it in the comments section below--I'm all ears! © 2014 by Joy Sussman/JoyfullyGreen.com LLC. All rights reserved. All photos and text digitally fingerprinted and watermarked. Please do not use any of my photographs without asking me first for permission at JoyfullyGreen.com@gmail.com and then clearly linking back to this site with photo credits. Site licensed by Creative Commons. Please don't let me give you the wrong impression: There are plenty of times when our house looks like a roving band of toddlers went marauding through it. And we affectionately refer to our laundry room as "Laundry Mountain." I'm just saying that when my life gets really, really, REALLY crazy (this week, for example), sometimes the best thing to do (for me, anyway) is put down the paperwork and pick up a sponge. Because when my to-do lists are overflowing, I need a clean slate somewhere. I can't think straight when I'm looking around the room and noticing (even with peripheral vision) dirty dishes not loaded into the dishwasher. Or an orphaned sock in the middle of the living room floor. Or the couch's throw pillows thrown everywhere except on the couch. So, that's when I get up and straighten up. Which realigns my mind. Win-win. "But Mom," my kids have whined to me on many occasions, "Whyyyyyyyyyyyy do we neeeeeeeeeeed to clean our rooms?" "Clean house, clear mind," I tell them. Turns out the kids think better, too, when they're not tripping over their own Legos. They're calmer in a clean room. They have room to groove, instead of acting like little bulls in little china shops, knocking over anything and everything in their paths. If you've been reading this blog for any length of time, you already know that I'm a big proponent of evaluating our possessions on a regular basis and figuring out what we aren't using anymore. If you have so much stuff to clean that it's exhausting to even think about it, it's probably high-time to weed it out. Pass it on to somebody who will get good use out of it. That could mean a yard sale, Craig's List, eBay, or Goodwill, but sometimes, it's as easy as putting a "FREE!" sign on it at the curb. So, if your mind is feeling cluttered, take a look around at the current state of your house. Notice any correlation? Your turn: Do you ever clean the house to clear your mind? Let's hear it in the comments section below--I'm all ears!